An overview of clinical practice guidelines for outpatient sedation | Интернет-издание "Новости медицины и фармации"
У статті наведені основні поняття та принципи анестезіологічного забезпечення амбулаторних операцій у дорослих та дітей. Проведено детальний аналіз клінічних настанов та сучасних досліджень, що стосуються процедурної седації. Літературні дані систематизовано та подано як огляд обраних найбільш актуальних питань амбулаторної анестезіології. В статье изложены основные понятия и принципы проведения анестезиологического обеспечения амбулаторных операций у взрослых и детей. Проведен подробный анализ клинических рекомендаций и современных исследований, касающихся процедурной седации. Литературные данные систематизированы и поданы в виде обзора избранных наиболее актуальных вопросов амбулаторной анестезиологии. 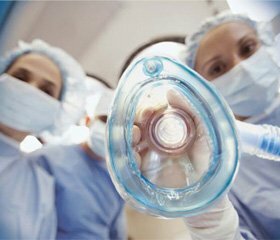 This article presents the basic concepts and principles of outpatient anesthesia in adults and children (MedLine, EMBASE, PubMed). Administration of local anesthesia, sedation and general anesthesia is an important part of outpatient clinical practice. Conscious sedation and pain control can be defined as the application of different chemical agents for the prevention and effective treatment of perioperative anxiety and pain. Procedural sedation is a drug-induced depression of consciousness during which patients respond to verbal commands alone or accompanied by tactile stimulation. No interventions are required to maintain a patent’s airway, and spontaneous ventilation is adequate, as well as cardiovascular function. For anesthesiologists, who use in-office sedation, it is important that they have education, experience and skills for safely administer conscious sedation. Moreover, practitioners and their assistants need regular training in basic life support and advanced live support in adults and children. Consequently, Standards for Basic Anesthetic Monitoring are intended to encourage quality patient care. They use for all case of procedural sedation, general anesthetics, regional anesthetics and monitored anesthesia care. There are many techniques for outpatient sedation, such as inhalation, oral, intranasal, intravenous administration of sedatives. However, the lingering effects of orally administered sedation medications can lead to prolonged sleep, irritability, and vomiting in children after they have been discharged from the dental clinic. Total intravenous anesthesia (TIVA) is a technique of general anesthesia, which uses a combination of agents given exclusively by the intravenous route without the use of inhalation agents. The inherent benefits of TIVA via a Target Controlled Infusion make it a more manageable technique for the patient’s care, while guarantees a faster and more comfortable patient recovery. The Bispectral Index (BIS) provides additional information for standard monitoring techniques that helps guide the administration of sedative-hypnotic agents. In results, the use of the BIS monitor helps to correct the level of office sedation so that less drugs are used to maintain the target level. The decision to discharge a patient undergoing outpatient sedation is an important part of the treatment. It must be achieved by an anesthesiologist and a surgeon without decrease of care quality. Therefore, the use of an objective assessment for the management of a fair and safe discharge is essential. The Post Anaesthetic Discharge Scoring System has proved to be an usefull scale that provides safe and comfortable discharge of patients. 1. Stewart L. Cohen, Keira P. Mason, Mark A.Saxen. Literature Review for Office–Based Anesthesia // Anesthesia. — 2018. — № 65. — Р. 66–68. — https://doi.org/10.2344/anpr–65–01–11. 2. Kehlet H., Dahl J.B. Anaesthesia, surgery, and challen–ges in postoperative recovery // Lancet. — 2003. — № 362. — Р. 1921–1928. 3. Setty M., Montagnese T.A., Baur D., Aminoshariae A., Mickel A. An analysis of moderate sedation protocols used in dental specialty programs: a retrospective observational study // J. Endod. — 2014. — № 40(9). — Р. 1327–31. PMID: 25146012. DOI: 10.1016/j.joen.2014.05.015. 4. Nelson T.M., Xu Z. Pediatric dental sedation: challenges and opportunities // Clin. Cosmet. Investig. Dent. — 2015. — № 7. — Р. 97–106. DOI: 10.2147/CCIDE.S64250. PMID: 26345425. PMCID: PMC4555969. 5. Kehlet H., Wilmore D.W. Multimodal strategies to improve surgical outcome // American Journal of Surgery. — 2002. — № 183. — Р. 630–641. 6. Wilmore D.W., Kehlet H. Management of patients in fast track surgery // British Medical Journal. — 2001. — № 322(7284). — Р. 473–476. 7. Maessen J.M., Dejong C.H., Kessels A.G., von Meyenfeldt M.F. Enhanced recovery after surgery (ERAS) Group. Length of stay: an inappropriate readout of the success of enhanced recovery programs // World Journal of Surgery. — 2008. — № 32(6). — Р. 971–975. 8. Philip Yen, Simon Prior, Cara Riley et al. A Comparison of Fospropofol to Midazolam for Moderate Sedation During Outpatient Dental Procedures // Anesthesia Progress. — 2013. — № 60. — Р. 162–177. — https://doi.org/10.2344/0003–3006–60.4.162. 9. Gowri Sivaramakrishnan and Kannan Sridharan. Nitrous Oxide and Midazolam Sedation: A Systematic Review and Meta–Analysis // Anesthesia Progress. — 2017. — № 64. — Р. 59–65. — https://doi.org/10.2344/anpr–63–03–06. 10. Mishra N., Birmiwal K.G., Pani N., Raut S., Sharma G., Rath K.C. Sedation in oral and maxillofacial day care surgery: A comparative study between intravenous dexmedetomidine and midazolam // Natl. J. Maxillofac. Surg. — 2016. — № 7(2). — Р. 178–185. DOI: 10.4103/njms.NJMS_78_16. PMID: 28356690. PMCID: PMC5357934. 11. Practice Guidelines for Moderate Procedural Sedation and Analgesia 2018: Task Force on Moderate Procedural Sedation and Analgesia. A Report by the American Society of Anesthesiologists, the American Association of Oral and Maxillofacial Surgeons, American College of Radiology, American Dental Association, American Society of Dentist Anesthesiologists, and Society of Interventional Radiology // Anesthesiology. — 2018. — № 128. — Р. 437–479. DOI: 10.1097/ALN.0000000000002043. 12. European Society of Anaesthesiology and European Board of Anaesthesiology guidelines for procedural sedation and analgesia in adults // Eur. J. Anaesthesiol. — 2017. — № 34. — Р. 1–19. [Indexed for MEDLINE]. 13. American Society of Anesthesiologists. Continuum of depth of sedation: definition of general anesthesia and levels of sedation/analgesia (аpproved by the ASA House of Delegates on October 13, 1999, and last amended on October 15, 2014). [Indexed for MEDLINE]. 14. Hong K.S., Choi E.Y., Park D.A., Park J. Safety and Efficacy of the Moderate Sedation During Flexible Bronchoscopic Procedure: A Systematic Review and Meta–Analysis of Randomized Controlled Trials // Medicine (Baltimore). — 2015. — № 94(40). — Р. 1459. DOI: 10.1097/MD.0000000000001459. PMID: 26447999. PMCID: PMC4616766. 15. Gómez–Ríos M.Á., Freire–Vila E., Kuczkowski K.M., Pensado–Castiñeiras A. Comparison of sevoflurane administered through a face mask versus rectal thiopental sodium in children undergoing magnetic resonance imaging // J. Matern. Fetal. Neonatal. Med. — 2017. — № 30(4). — Р. 437–441. PMID: 27053335. DOI: 10.1080/14767058.2016.1174994 [Indexed for MEDLINE]. 16. Masuda R., Nonaka M., Nishimura A., Gotoh K., Oka S., Iijima T. Optimal and safe standard doses of midazolam and propofol to achieve patient and doctor satisfaction with dental treatment: A prospective cohort study // PLoS One. — 2017. — № 12(2). — Р. 0171627. DOI: 10.1371/journal.pone.0171627. [PubMed]. 17. Bal B.S., Crowell M.D., Kohli D.R., Menendez J., Rashti F., Kumar A.S., Olden K.W. What factors are associated with the difficult–to–sedate endoscopy patient? // Dig. Dis. Sci. — 2012. — № 57. — Р. 2527–34. [PubMed]. 18. Fang H., Yang L., Wang X., Zhu H. Clinical efficacy of dexmedetomidine versus propofol in children undergoing magnetic resonance imaging: a meta–analysis // Int. J. Clin. Exp. Med. — 2015. — №8(8). — Р. 11881–9. PMID: 26550100. PMCID: PMC4612785. 19. Andrade C., Gill J., Kulkarni P. et al. Evaluation of the safety of conscious sedation and gastrointestinal endoscopy in the veteran population with sleep apnea // Am. J. Gastroenterol. — 2013. — № 108. — Р. 480. [PubMed]. 22. American Society of Anesthesiologists. Task Force on Sedation and Analgesia by Non–Anesthesiologists. Practice guidelines for sedation and analgesia by nonanesthesiologists // Anesthesiology. — 2002. — № 96. — Р. 1004–17. [PubMed]. 23. Guidelines for the use of sedation and general anesthesia by dentists. Availablе at: http://www.ada.org/w/media/ADA/About %20the %20ADA/Files/anesthesia_use_guidelines.ashx. Accessed October 25, 2015. 24. Papachristou G.I., Gleeson F.C., Papachristou D.J., Petersen B.T., Baron T.H. Endoscopist administered sedation during ERCP: Impact of chronic narcotic/benzodiazepine use and predictive risk of reversal agent utilization // Am. J. Gastroenterol. — 2007. — № 102. — Р. 738–43. [PubMed]. 25. Heuss L.T., Schnieper P., Drewe J., Pflimlin E., Beglinger C. Safety of propofol for conscious sedation during endoscopic procedures in high–risk patients: A prospective, controlled study // Am. J. Gastroenterol. — 2003. — № 98. — Р. 1751–7. [PubMed]. 27. Omata F., Masuda K., Fujita Y., Fukui T. Risk factors of hypoxia during conscious sedation for colonoscopy: A prospective time–to–event analysis // Gastro Endosc. — 2014. — № 1. — Р. AB224. [PubMed]. 28. Müller S., Prolla J.C., Maguilnik I., Breyer H.P. Predictive factors of oxygen desaturation of patients submitted to endoscopic retrograde cholangiopancreatography under conscious sedation // Arq. Gastroenterol. — 2004. — № 41. — Р. 162–6. [PubMed]. 29. Coté C.J., Wilson S.; American Academy of Pediatrics; American Academy of Pediatric Dentistry: Guidelines for monitoring and management of pediatric patients before, during, and after sedation for diagnostic and therapeutic procedures: Update 2016 // Pediatrics. — 2016. — № 138. — Р. 20161212. [PubMed]. 30. Nagoshi M., Reddy S., Bell M., Cresencia A., Margolis R., Wetzel R., Ross P. Low–dose dexmedetomidine as an adjuvant to propofol infusion for children in MRI: A double–cohort study // Paediatr. Anaesth. — 2018. DOI: 10.1111/pan.13400. PMID:29882298. 31. Standards for Basic Anesthetic Monitoring, American Society of Anesthesiologists // Approved by the ASA House of Delegates October 21, 1986, and last amended October 28, 2015. — Retrieved May 9, 2017. — http://www.asahq.org/quality–and–practice–management/standards–and–guidelines/search?q=basic anesthesia monitoring. 33. Weaver J. The latest ASA mandate: CO2 monitoring for moderate and deepsedation // Anesth. Prog. — 2011. — № 58(3). — Р. 111–2. [PubMed]. 34. Lightdale J.R., Goldmann D.A., Feldman H.A., Newburg A.R., DiNardo J.A., Fox V.L. Microstream capnography improves patient monitoring during moderate sedation: a randomized, controlled trial // Pediatrics. — 2006. — № 117(6). — Р. 1170–8. Epub 2006. PMID: 16702250. DOI: 10.1542/peds.2005–1709. 35. Evaluation of sedation failure in the outpatient oral and maxillofacial surgery clinic // J. Oral Maxillofac. Surg. — 2007. — № 65(4). — Р. 645–50. PMID: 11381378. DOI: 10.1053/joms.2001.23366. 36. Haberland C.M., Baker S., Liu H. Bispectral Index Monitoring of Sedation Depth in Pediatric Dental Patients // Anes–thesia Progress. — 2011. — № 58. — Р. 66–72. — https://doi.org/10.2344/0003–3006–58.2.66. Р. 206–213. PMID: 27825666. DOI: 10.1016/j.redar.2016.08.005. 38. Powers K.S., Nazarian E.B., Tapyrik S.A. et al. Bispectral index as a guide for titration of propofol during procedural sedation among children // Pediatrics. — 2005. — № 115(6). — Р. 1666–74. PMID: 15930231. DOI: 10.1542/peds.2004–1979. 39. Karamnov S., Sarkisian N., Grammer R. et al. Analysis of adverse events associatedwith adult moderate procedural sedation outside the operating room // J. Patient Saf. — 2014. — № 10(3). — Р. 125–32. [Indexed for MEDLINE]. 40. Anwer M., Manzoor S., Muneer N., Qureshi S., Pak J. Compliance and Effectiveness of WHO Surgical Safety Check list: A JPMC Audit // Med. Sci. — 2016. — № 32(4). — Р. 831–5. DOI: 10.12669/pjms.324.9884. PMID: 27648023. PMCID: PMC5017086. 41. Becker D.E., Daniel A., Haas D.A. ABC Management of Complications During Moderate and Deep Sedation: Respiratory and Cardiovascular Considerations // Anesth. Prog. — 2007. — № 54(2). — Р. 59–69. DOI: 10.2344/0003–3006(2007)54[59:MOCDMA]2.0.CO;2. 42. Redondo–Cerezo E., Sánchez–Robaina A., Martínez Cara J.G. et al. Gastroenterologist–guided sedation with propofol for endoscopic ultrasonography in average–risk and high–risk patients: a prospective series // Eur. J. Gastroenterol. Hepatol. — 2012. — № 24(5). — Р. 506–12. DOI: 10.1097/MEG.0b013e328350fcbd. 43. Meng Q.T., Cao C., Liu H.M. et al. Safety and efficacy of etomidate and propofol anesthesia in elderly patients undergoing gastroscopy: A double–blind randomized clinical study // Exp. Ther. Med. — 2016. — № 12(3). — Р. 1515–1524. PMID: 27602075. PMCID: PMC4998221. DOI: 10.3892/etm.2016.3475. 44. Czwornog J., Austin G.L. Body mass index, age, and gender affect prep quality, sedation use, and procedure time du–ring screening colonoscopy // Dig. Dis. Sci. — 2013. — № 58. — Р. 3127–33. [PubMed]. 45. Cha J.M., Jeun J.W., Pack K.M. et al. Risk of sedation for diagnostic esophagogastroduodenoscopy in obstructive sleep apnea patients // World J. Gastroenterol. — 2013. — № 19. — Р. 4745–51. DOI: 10.3748/wjg.v19.i29.4745. PMCID: PMC3732847. PMID: 23922472. 46. Goldman L., Caldera D.L., Nussbaum S.R. et al. Multifactorial index of cardiac risk in noncardiac surgical procedures // N. Engl. J. Med. — 1977. — № 297. — Р. 845–850. 47. Площенко Ю.О. Роль та місце карідопротекції з використанням сучасних інфузійних препаратів у періопераційному періоді / Площенко Ю.О., Клигуненко О.М. // Медицина невідкладних станів. — 2017. — № 6(85). — С. 16–26. DOI: http://dx.doi.org/10.22141/2224–0586.6.85.2017.112769. 48. Coté C.J., Lerman J., Ward R.M. et al. Pharmacokinetics and pharmacology of drugs used in children // A practice of anesthesia for infants and children: 5th edition / C.J. Coté, J. Lerman, B.J. Anderson, ed. — Philadelphia: Elsevier Health Sciences, 2013. — Р. 111. 49. Клигуненко Е.Н. Трудная интубация трахеи: современные методы решения / Е.Н. Клигуненко, О.В. Лященко, В.В. Ехалов, И.В. Носенко, С.А. Лебедев // Медицина неотложных состояний. — № 5(84). — 2017. — С. 61–64. DOI: 10.22141/2224–0586.5.84.2017.109360. 51. Sankar A., Johnson S.R., Beattie W.S. et al. Reliability of the American Society of Anesthesiologists physical status scale in clinical practice // Br. J. Anaesth. — 2014. — № 113(3). — Р. 424–32. DOI: 10.1093/bja/aeu100. [PubMed]. 52. American Society of Anesthesiologists. Practice guidelines for preoperativefasting and the use of pharmacologic agents to reduce the risk of pulmonaryaspiration: application to healthy patients undergoing elective procedures // Anesthesiology. — 2011. — № 114. — Р. 495. [PubMed]. 53. American Society of Anesthesiologists: Practice guidelines for preoperative fasting and the use of pharmacologic agents to reduce the risk of pulmonary aspiration: Application to healthy patients undergoing elective procedures: An updated report // Anesthesiology. — 2017. — № 126. — Р. 376–93. [PubMed]. 54. Wysokinski W.E. Periprocedural Bridging Management of Anticoagulation // Circulation. — 2012. — № 126. — Р. 486–490. 55. Bridging anticoagulation: is it needed when warfarin is interrupted around the time of a surgery or procedure? BRIDGE Study Investigators // Circulation. — 2012. — № 125. — Р.e496–8. DOI: 10.1161/ CIRCULATIONAHA.111.084517. PMID: 22451610. 56. Eerenberg E.S., Kamphuisen P.W., Sijpkens M.K. et al. Reversal of rivaroxabanand dabigatran by prothrombin complex concentrate: a randomized, placebo–controlled, crossover study in healthy subjects // Circulation. — 2011. — № 124. — Р. 1573–1579. 57. Tafur A., McBane R., Wysokinski W.E. et al. Predictors of periprocedural bleeding among patients on chronic anticoagulation // J. Thromb. Haemost. — 2012. — № 10. — Р. 261–267. DOI: 10.1111/j.1538–7836.2011.04572.x. 58. Dahl J.B., Kehlet H. The value of pre–emptive analgesia in the treatment of postoperative pain // Br. J. Anaesth. — 1993. — № 70. — Р. 434–439. 60. Campbell L., Engbers F.H., Kenny G.N. Total intravenous anaesthesia // CPD Anaesthesia. — 2001. — № 3(3). — Р. 109–119. 61. Dionne R.A., Yagiela J.A., Moore P.A. et al. Comparing efficacy and safety of fourintravenous sedation regimens in dental outpatients // J. Am. Dent. Assoc. — 2001. — № 132(6). — Р. 740–51. 62. Mu J., Jiang T., Xu X.B., Yuen V.M., Irwin M.G. Comparison of target–controlled infusion and manual infusion for propofol anaesthesia in children // Br. J. Anaesth. — 2018. — № 120(5). — Р. 1049–1055. DOI: 10.1016/j.bja.2017.11.102. PMID: 29661382. 63. Cravero J.P., Blike G.T. Reviewof pediatric sedation // Anesth. Analg. — 2004. — № 99. — Р. 1355–64. 64. Mould D.R., DeFeo T.M., Reele S. et al. Simultaneous modeling of the pharmacokinetics and pharmacodynamics of midazolam and diazepam // Clin. Pharmacol. Ther. — 1995. — № 58. — Р. 35–43. 65. Collado V., Faulks D., Nicolas E. et al. Conscious sedation procedures using intravenousmidazolam for dental care in patients with different cognitive profiles: aprospective study of effectiveness and safety // PLoS One. — 2013. — № 8(8). — Р.e71240. 66. Atalay Y.O., Leman T., Tobias J.D. Efficacy and safety of intravenous thiopental for sedation during magnetic resonance imaging in pediatric patients: A retrospective analysis. PMID: 28442957. PMCID: PMC5389237. DOI: 10.4103/1658–354X.203086. 67. Giovannitti J.A. Pharmacology of intravenous sedative/anesthetic medications used in oral surgery // Oral Maxillofac. Surg. Clin. North Am. — 2013. — № 25(3). — Р. 439–51. 68. Клигуненко Е.Н. Роль кетамина в периоперационном обезболивании (обзор) / Е.Н. Клигуненко, В.В. Халимончик // Медицина неотложных состояний. — 2017. — № 5(84). — С. 31–37. DOI: 10.22141/2224–0586.5.84.2017.109357. 69. Naughton M., Clarke G., O’Leary O.F. et al. A review of ke–tamine in affective disorders: current evidence of clinical efficacy, limitations of use and preclinical evidenceon proposed mechanisms of action // Journal of Affective Disorders. — 2014. — № 156. — Р. 24–35. 70. Hernando B., Martinez–Simon A., Cacho–Asenjo E. et al. Recovery time after oral and maxillofacial ambulatory surgery with dexmedetomidine: an observational study // Clin. Oral Investig. — 2018. — № 20. PMID: 29679228. DOI: 10.1007/s00784–018–2447–5. 71. Amrein R., Hetzel W., Hartmann D. et al. Clinical pharmacology of flumazenil // Eur. J. Anaesthesiol. Suppl. — 1988. — № 2. — Р. 65–80. 72. Palumbo P., Tellan G., Perotti B., Pacilè M.A., Vietri F., Illuminati G. Modified PADSS (Post Anaesthetic Discharge Scoring System) for monitoring outpatients discharge // Ann. Ital. Chir. — 2013. — № 84(6). — Р. 661–5. PMID: 23165318.